Comments: Black Lithiophorite cementing gravel. Location: Pöhlberg, Annaberg - Buchholz, Erzgebirge, Saxony, Germany. Scale: Specimen size 6 cm. Comments: Tan-brown lithiomarsturite with cream-colored lithiophosphate in matrix. Location: Foote Mine, Kings Mtn, North Carolina, USA. Scale: 2" x 3". Location: Ognevka Deposit, Kalbinskii Range, Kazakhstan. Scale: Specimen Size 3x2 mm. Comments: Black crystalline grains of lithiowodginite in pegmatite. Location: Tanco Mine, Bernic Lake, Manitoba, Canada. Scale: See Photo. Comments: Transparent nearly colorless lithosite in syenite rock. Location: Vuonnemiok River, Khibiny Massif, Kola Peninsula, Murmansk District, Russia. Scale: See Photo. Comments: Bright blue crystalline litidionite fragment. Location: Vesuvius, Campania, Italy. Scale: See Photo. Comments: Dark cherry-red litvinskite in matrix. Location: Shkatulka pegmatite, Umbozero mine, Alluaiv Mt, Lovozero Massif, Kola Peninsula, Murmanskaja Oblast', Northern Region, Russia. Scale: Picture size 4 mm. Comments: Deep blue striated prismatic crystal of liveingite on a white dolomite matrix. Location: Lengenbach quarry Binntal, Valais, Switzerland. Scale: Not Given. Comments: Black prismatic seligmannite crystals with crystalline black liveingite. Location: Lengenbach Quarry, Binnental, Valais, Switzerland. Scale: See Photo. Comments: Strongly striated, metallic gray liveingite crystal on white dolomite. Location: Lengenbach quarry, Binntal, Valais, Switzerland. Scale: Crystal size 3 mm. Comments: Dark brown, acicular-columnar crystals of livingstonite in anhydrite. Location: Guerrero, Mexico. Scale: 2x3 cm. Comments: Lizardite pseudomorphously replacing olivine. Location: Snarum, Norway. Scale: 2x2 cm. Comments: White coating of lokkaite-(Y) on matrix with hellandite and possible kainosite. Location: Evans-Lou Quarry, Quebec, Canada. Scale: Specimen Size 3 x 5 cm. Comments: Aegerine schist with reddish crystalline grains of lomonosovite. Location: Ilimaussaq, Kvanefjeld, Greenland. Scale: Picture size 0.5 cm. Comments: Yellow crystalline bornemanite in dark brown lomonosovite. Location: Yubileinaya Pegmatite, Lovozero Massif, Kola Peninsula, Murmansk District, Russia. Scale: See Photo. Comments: A dodecahedral crystal of londonite. Location: Antandrokomby pegmatite, Manandona valley, Sahatany Valley, Betafo - Antsirabé region, Antananarivo Province, Madagascar. Scale: Crystal size 7 mm. Comments: A yellow , lustrous, well developed londonite crystal 1.2 cm. on matrix. Location: Antandrokomby, Sahatany valley, Madagascar. Scale: Crystal size 1.2 cm. 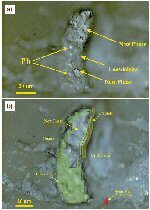 Comments: a) A Reflected light photograph of lonsdaleite and unidentified polymorph (New Phase) with lead comtamination. b) synchrotron X-ray diffraction, imaging and X-ray fluorescence fine-scale mapping of the different phases. (ESRF 2003 highlights). Location: Shocked gneisses from the Popigai Crater, Russia. Scale: See Image. © Eur. Sync. Rad. Fac. Comments: Sharp penetration twin of cubic loparite-(Ce) about 7 mm. across on phoenite matrix. Location: Flora Mt., Lovosero massif, Kola Peninsula, Russia. Scale: 3.8x3.3x2.6 cm.